Sleepy Hollow is a quiet, isolated valley along the Hudson River in New York State. The inhabitants of this neighborhood are quite superstitious and believe in all manner of tales, stories and fables about ghosts, goblins and things that go bump in the night. The most famous of these legends is that of the Headless Horsemen, the apparition of a Hessian soldier who lost his head to a cannonball during the Revolutionary War, and who now, it is said, rides forth at night to the scene of the battle seeking his skull. One day an awkward, yet ambitious, schoolmaster from Connecticut by the name of Ichabod Crane arrives in Sleepy Hollow. Shortly thereafter he sets his marital sights on Katrina Van Tassel, the beautiful daughter of a wealthy Dutch farmer, who has many suiters including the hot-blooded brawler and prankster Brom Bones. One night, following a gathering at the Van Tassel farmstead, Ichabod Crane mysteriously disappears and is not seen or heard from again in Sleepy Hollow. What befell the unfortunate schoolmaster? Did he fall victim to the Headless Horseman on one of his nighttime rides or is there a more earthly explanation? 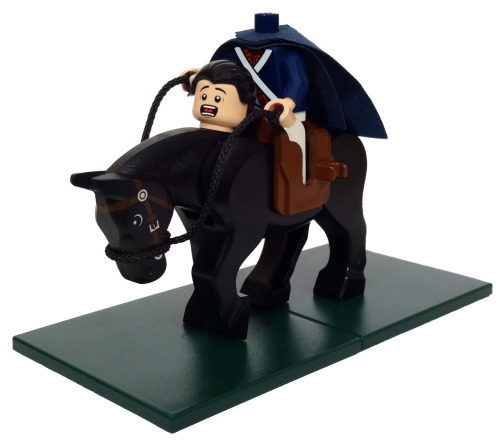 SLEEPY HOLLOW RE-IMAGINED: In this volume, the original and unabridged text of The Legend of Sleepy Hollow is accompanied by twenty-eight charming color photographic illustrations featuring custom designed models built using only LEGO® brand minifigures and bricks. This uniquely illustrated edition is sure to delight LEGO enthusiasts, as well as fans of the writings of Washington Irving, children and adults alike. LEGO® is a trademark of the LEGO Group of Companies. The LEGO Group has not been involved in nor has it in any way licensed or authorized the publication of this book. The Legend of Sleepy Hollow Re-Imagined is available from all good bookstores including Amazon USA, Barnes and Noble USA, Amazon UK, Waterstones UK and for free shipping worldwide Book Depository.